Special 6-1 is the first level of Special 6 in Super Mario 3D Land. It is based off of World 3-1. The player starts out in a desert area with a large structure in front of them and several ? Blocks around them, all but two of these are Propeller Boxes, the other two are Poison Mushrooms. Around the back of the structure are three sets of three Coins. At the front of the structure, behind a fake 1-Up Mushroom sign is a + Clock. On the structure is another + Clock and a Note Block that leads to a Door. Inside this room is another + Clock and another Note Block that leads to a higher section in the room. The door on the lower level leads outside, where there is a fake Goomba sign, and three ? Blocks, the one closest to the door contains a Statue Leaf. The door on the upper level also leads outside, where there are retractable stone platforms the lead to a door. In the next room is a corridor, with Spikes around the edges, that leads to a door that goes outside. Outside are two more + Clocks and a small stone structure with a Wallop on it, in front of the Goal Pole. 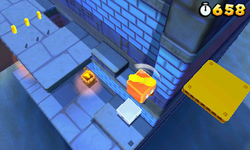 Star Medal 1: The Star Medal is on the top right corner of the platform on the structure closest to the beginning of the course. Star Medal 2: The Star Medal is floating high above the door on the far left in the first room. Star Medal 3: The third Star Medal is above the Wallop just before the Goal Pole.